While just about everyone is writing about how IT and the businesses it serves need to be transformed, the actual industry answers to both digital and IT transformation remain unclear at best. Are transformational initiatives all about analytics and big data? Or are they about the move to cloud in all its varieties? Support for mobile? More agile ways of working and developing software? Or are they actually all about crafting teams to promote more proactive dialog between the business and IT? The truth is, of course, digital and IT transformation depend on all of the above and more. They also depend on a resilient infrastructure that’s easily adapted to changing business priorities without requiring long hours spent on maintenance, updates, and addressing problems of service availability. But making all this work clearly and cohesively is far beyond the purview of almost any solution today—whether from a software management perspective or from a hardware infrastructure perspective. 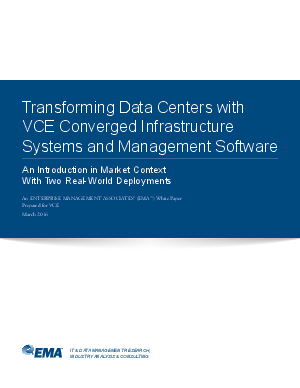 Read this whitepaper to learn how Dell EMC converged infrastructure is paving the path to IT transformation.